Are you interested in some great things to do while you are in Savannah, Georgia! We have a great Savannah vacation guide that lists some of the top things to do while you’re here. 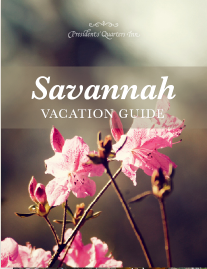 Click the picture to the right to download the free Savannah Vacation Guide! Savannah has a unique allure that pulls you in the moment you arrive. The streets draped in Spanish moss, the inspiring architecture, and the array of boutiques and antique galleries make it one of the most romantic cities in the American South. When you visit Savannah, you can quite literally get lost in the numerous museums, art galleries, parks, and shops. No matter what you are looking for, Savannah has just about everything for everyone! If you are looking to learn more about Savannah’s unique history specifically, then you will definitely want to check out the Savannah History Museum. The museum is located in an old train station, and you’ll find both permanent and rotating exhibits that chronicle the history of Savannah. Great Breakfast Places in Savannah! — Welcome to Our New Website!